Whilst eating a fine dinner at the La Cabaña Park we got an eyeful of the carnes. Now we're facing an even bigger selection at the local charcutería. At left you see the jamon pata negra, the highest-rated smoked pork around. 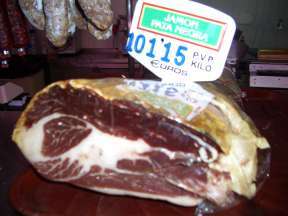 At €101.15 per kilogram (about US$50 per pound) it's three times the price of the usual, excellent proscuitto. I see chorizo and all sorts of other meats, in a bewildering variety of cutis, from all the animals to which I'm used to seeing. But no pato. Omi Marga is in search of ingredients for her crispy duck, but she's not finding any duck. This could be a problem. The butcher is very happy to offer her a goose, but doesn't seem to have any prospects of getting duck, nor any clue as to other sources. Omi Marga takes a taxi to make an appointment with a hairdresser. We head over to the Pasteleria Bomboneria San Francisco, San Fernando.